SAN DIEGO - June 13, 2016 - PRLog -- On June 12, 2016, the Rady School of Management at UC San Diego held a commencement ceremony for 169 students at the RIMAC arena at UC San Diego. The 2016 commencement is a special celebration for the school, which marks the 10th anniversary of the school's first graduating class. The commencement ceremony celebrated the graduation of the school's Full-Time, FlexEvening and FlexWeekend MBA classes, Ph.D. students and the Master of Finance class. Family, friends and Rady School supporters joined the graduates for the ceremony. The commencement keynote speakers were Rady School 2006 MBA alumni Ciara Kennedy, a life science industry executive and Sean McCarthy, a biotech industry executive. Kennedy, a graduate of the inaugural Rady School class, highlighted what has worked well for her during her journey over the past 10 years since graduation. "The greatest resource your MBA provides you are the people sitting around you and the larger Rady School community," Kennedy said. "These are the people who can, and want to, help you. My Rady School classmates are often the first people I think of when I need to get an opinion on something." Rady School Dean Robert S. Sullivan, who along with Graduate Division Dean Kim Barrett, presided over the ceremony, noted that the class of 2016 is poised to follow in the tradition of excellence established by the school's first class. "All of today's graduates - Ph.D.s, Master of Finance, and MBAs - are exceptional; they are innovators, creators and owners of the Rady School of Management," Dean Sullivan said at the ceremony. "They arrived at the school with extraordinary credentials and potential. All have a commitment to excellence and impact - to being leaders, and to being among the very best. Yet, we know that the most important contributions of this class lie ahead, during the next years and decades. What you will do for communities; what you do for society; the difference and impact that we know you can and will make." Students and alumni also took part in the ceremony, with Yoshiaki Ichinowatari (MBA '16) delivering the student commencement address and Rady Alumni Association President-elect Bosco Lujan (MBA '12) delivering the alumni address. During the graduation ceremony, Pauline M. Foster, a community philanthropist and founding donor of the Rady School, was honored with the 2016 Rady School Founders' Medal. 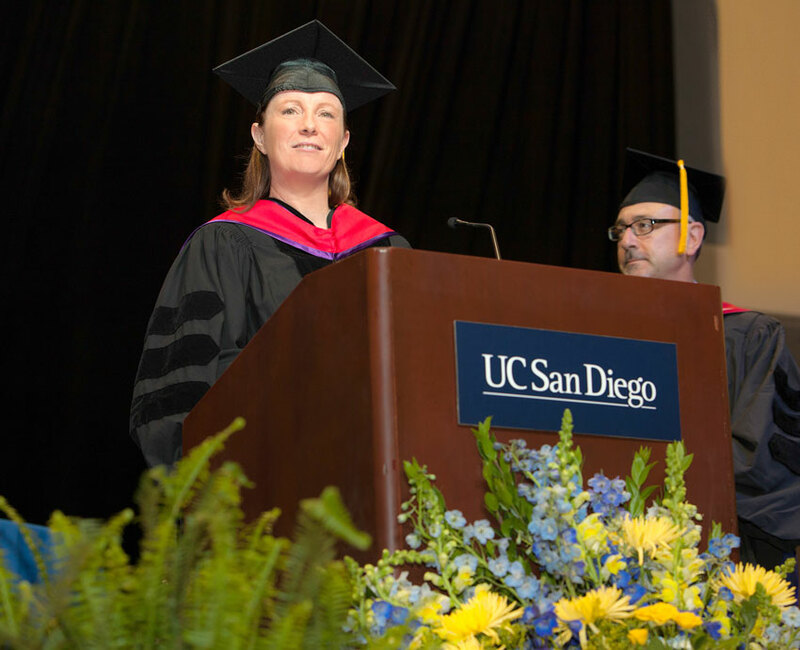 Foster was recognized for her longtime support of UC San Diego and the Rady School, where she established the Stanley and Pauline Foster Endowed Chair and the Foster MBA Fellowship Fund. To date, the Foster MBA Fellowship endowed fund has supported 79 Rady School students. In addition, she also established the Pauline and Stanley Foster Pavilion for Cancer Care at the UC San Diego Health Jacobs Medical Center. She is a past recipient of the UC San Diego Chancellor's Medal and served as a trustee and board chair of the UC San Diego Foundation from 2002-2010.